One of the great artists of the 20th century, Lichtenstein is renowned for his unique aesthetic, which shares similarities with early twentieth century pulp and comic art. Vintage Roy Lichtenstein Tapestry Rug, Country of Origin: India, Circa Date: Mid-20th Century – Here is a dynamic and exciting vintage carpet – a vintage Pop art tapestry rug from the middle of the twentieth century featuring a beautiful image crafted by the peerless Roy Lichtenstein. 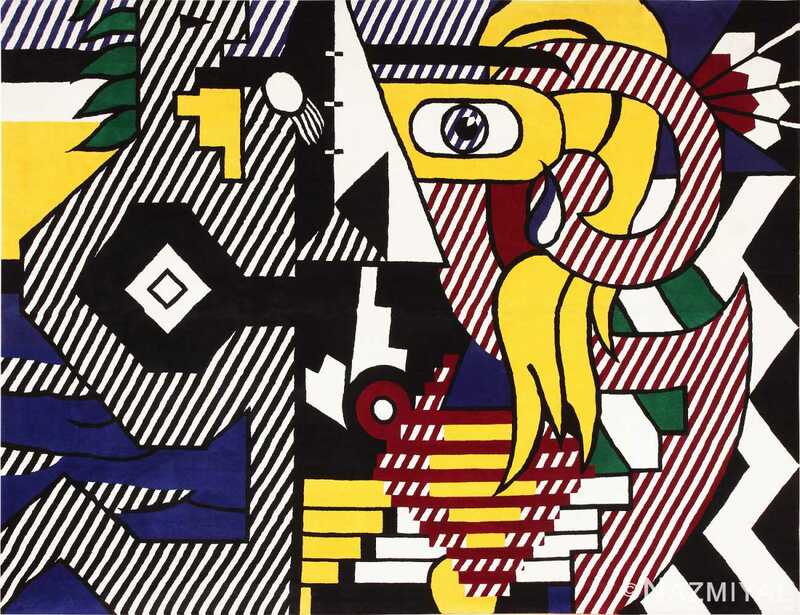 One of the most celebrated artists of the twentieth century, Lichtenstein is renowned for his unique and avant-garde aesthetic, which shares similarities with early twentieth century pulp and comic art. Before Lichtenstein began creating gallery worthy art depicting mid-century figures colored in dots and drawn with heavy black lines, this style was regarded as unappealing – sort of as the lowest common denominator in the art world. After Lichtenstein, however, the entire notion of high art and low art began to disintegrate. This charming carpet, which features a simple still life composition, offers a great deal of insight into the nature of Lichtenstein’s unique aesthetic. In the mid-19th century, a scene like this would have been rendered in an impressionist aesthetic; in the mid-20th century, however, that would no longer be appropriate. 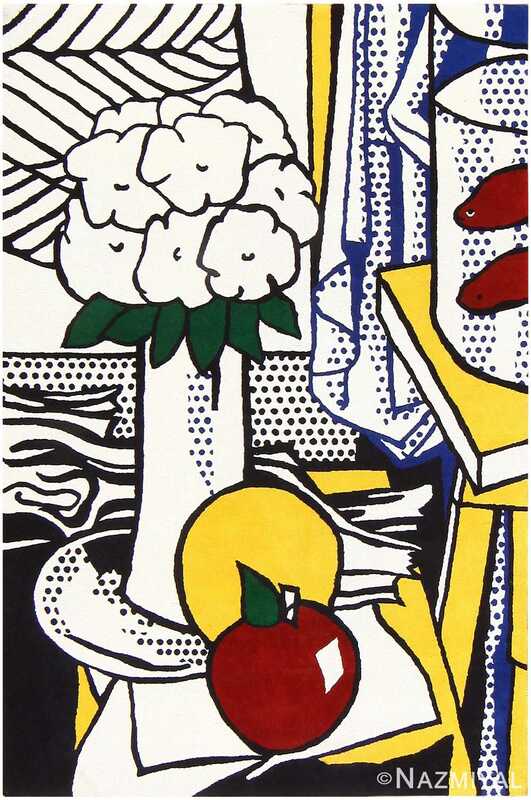 Lichtenstein was a unique figure whose vision moved the entire art world forward. This delightful rug by Roy Lichtenstein playfully interweaves design elements of Cubism with his signature cartoon-like pop-art style. Strategically placed yellow adds to the illusion of three dimensions.